Israeli soldiers abducted, on Tuesday at dawn, eight young Palestinian men from their homes, in occupied East Jerusalem, and confiscated a tractor near Hebron. Media sources said the soldiers invaded and searched many homes in the at-Tour and Jabal al-Mokabber neighborhoods, in addition to Shu’fat refugee camp, and interrogated many Palestinians before abducting eight. They stated that the soldiers abducted Omar Mohammad Abu Ghannam, Mohammad Ali Abu Ghannam, Mohammad Naji Abu Jom’a and Mohannad Khweiss, and Yousef Abu Laban, from at-Tour. The sources added that the soldiers also abducted Mohannad Kayyala, from Shu’fat refugee camp, in addition to Omar Abu Dheim and Karam ‘Oweisat from Jabal al-Mokabber. It is worth mentioning that Omar Mohammad Abu Ghannam is the brother of Ali, 16, who was killed by Israeli soldiers on April 24, 2015. In related news, the soldiers prevented farmers from plowing their lands, near the at-Tiwani illegal colony, which was built on Palestinian lands east of Yatta town, south of Hebron in the southern part of the West Bank. 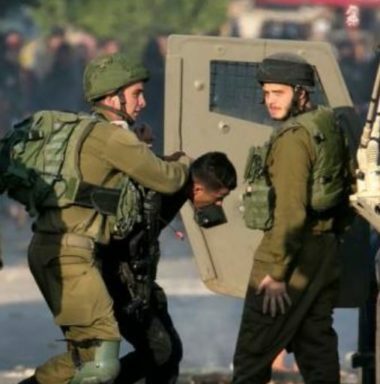 On Tuesday at dawn, the soldiers abducted two young men in the West Bank governorates of Ramallah and Jenin, after the army invaded many homes and searched them.